The last time this tale featured an “Original Cast Recording,” it was with My Fair Lady, in 1958, and so it is fitting that Phantom should follow, since both shows have a lot in common, and not just the involvement of Alan Jay Lerner (he did begin to write some lyrics for Phantom, notably for the song “Masquerade,” but fell seriously ill shortly thereafter and had to drop out; his work remains in part but is not credited). The Phantom and the Professor are two men hugely disappointed by life, and perhaps by humanity, who see their chance of redemption in a young woman they can only love from a distance but to whom they can prove they are more than they might seem, however much it might hurt them to see her draw away from them in the end (if either does). It is true that Henry Higgins does not resort to garrotting people in the theatre – much as he often sounds as though he wishes to do so – but there probably isn’t that much distance, other than a more substantial backstory and end story, between Freddy Eynsford-Hill and Raoul. It can be said that Andrew Lloyd Webber and his various lyricists came closer to the spirit of Leroux’s book than either of the cinematic interpretations. The 1925 Lon Chaney Phantom suggested a world of moral ambiguity in the sewers of the Paris Opera House, but whereas the novel ends with the Phantom dying, presumably of a broken heart, a few weeks after he lets Christine and Raoul go, moronic, gum-chewing cinema preview audiences - presumably the same loutish sort which saw no “laffs” in the original print of The Magnificent Ambersons - demanded a “better” ending, and so the version we now know ends with the mob – and yet again, we note how quickly and easily a placid mass of people can turn into a vengeful medieval hate squad – killing off the Phantom and throwing his body into the Seine. The 1943 Claude Rains film was a very loose improvisation on the story (additional characters, Raoul becoming a police inspector, etc.) which finally got tangled up with itself. Webber and producer Cameron Mackintosh had the vague idea to do a musical but watching both films got them nowhere. However, Webber subsequently found a second-hand copy of the novel in New York, and that was what got him started, particularly the gradually dawning realisation that the Phantom, while not incapable of creating evil, is more victim than villain. His original choice of lyricist was Jim Steinman, who was indisposed as he was busy working on Bonnie Tyler’s Secret Dreams And Forbidden Fire. He then turned to Starlight Express lyricist Richard Stilgoe, who wrote a first libretto draft, although the final libretto included considerable lyrical revision by the young Charles Hart. However, much of Stilgoe’s material remains in place, and even Mike Batt was called in to help out with the title song; you may wish to look at his subsequent career with Katie Melua as a kind of sequel to what this show proposes). Opening at Her Majesty’s Theatre in Haymarket – where, you may recall, Tommy Cooper died onstage two-and-a-half years beforehand – in October 1986, with Hal Prince directing, costumes by Maria Björnson and choreography by Gillian Lynne, and starring the cast featured in this recording, the show was an immediate hit; it continues to play at Her Majesty’s to this day and has been widely seen in numerous productions around the world. Only The Mousetrap and Les Miserables have had longer West End runs; worldwide, the show has been outgrossed only by The Lion King (a show with lyrics by Tim Rice and in which no human beings at all figure). It is unarguable that the soundtrack of the show is only half the experience and that you only experience its full impact when you go and see it performed live on stage, with phantasmagorical chandeliers, actual lakes, and so on. Listening to the music alone, however, without recourse to visuals (even a DVD is no substitute for watching the show play in real time), is rather like listening to Carl Stalling’s cartoon music without the visuals; it takes on new and entirely unexpected dimensions. It may be that Webber conceived the show – it is structured in the manner of a classic Rodgers and Hammerstein musical (Carousel comes to specific mind; compare Billy Bigelow’s ghost and “You’ll Never Walk Alone” with Christine’s despairing, or reassuring, “you are not alone”) with elements of light and serious opera dotted throughout – as a study of the power of music itself; are not the Phantom’s urges in “The Music Of The Night” a call to surrender to the spell of music, rather than a specific person? The stage directions indicate that Christine, in the Phantom’s direct or distant presence, is frequently in a “trance-like state” – in 1987, the year of Acid House. But listening to the music alone is a discomforting experience, and I think intentionally so. The two acts – divided into two albums – are connected but separate. The first act seems intent on retracing the history of light operetta, with its “operas” (shows within the show) being skilled, and often satirical, pastiches of Meyerbeer, Mozart, Gilbert and Sullivan and even (“All I Ask Of You”) Ivor Novello. Most of the subsidiary characters do not evolve from being archetypes – the camp duo of theatre managers/producers (one of whom is played by John Savident, who went on to play Fred Elliott in Coronation Street), the arrogant diva (who, towards the end of Act One, is temporarily turned into a toad, or at least croaks when she tries to sing – like Lina Lamont in Singin’ In The Rain, you do feel that this character needs a lot more sketching in) – and our attention is mainly drawn to the Phantom/Christine/Raoul triad. 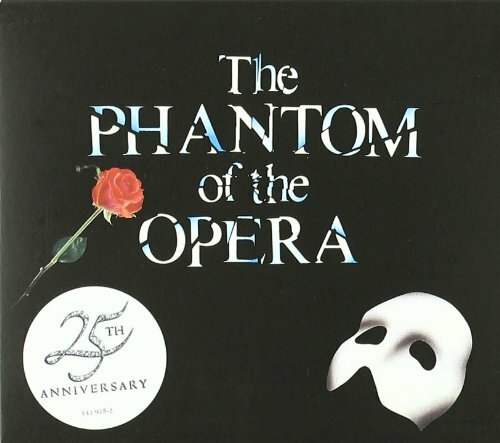 But the Phantom’s own theme owes nothing to nineteenth century courtliness – indeed, Roger Waters is on record grumbling that Webber copped it from Pink Floyd’s “Echoes” – and the façade is continually punctured by shards of implied dissonance (even quietly; see the last five chords of “The Music Of The Night”) before the whole thing is brought to a calamitous climax as the chandelier falls and the nineteenth century just fails to get assassinated. And yet, in Act Two – the same setting but six months later – nothing appears to have changed; the managers chortle about “the new chandelier” and it’s business as it ever was. It is as though the Phantom has to intervene for anything to move forward. Despite more and more intermittent swathes of lyricism – the recurring main themes from Act One, the disquieting paternal requiem that is “Wishing You Were Somehow Here Again,” with its spoken implication that the Phantom is the ghost of Christine’s father, and which sounds a little like Dvorak’s New World Symphony/Hovis theme, the melodic topline of “Masquerade” which reminds me of the Bonzo Dog Doo-Dah Band B-side “Readymades” – the music generally becomes steadily harsher and more dissonant. Here, as in Act One, lines of sung and spoken dialogue frequently overlap; this of course recalls Escalator but also large portions of Citizen Kane, that other study of a man who wanted to be loved but had no love to give, or wasn’t shown how to give it (and remember the long operatic sequence in the middle of Kane which Bernard Herrmann composed for the occasion, with Susan Alexander getting it wrong or just not getting there at all). And so Act Two of Phantom ends up sounding like nothing less than the work of a mid-late period Scott Walker, with musical nods to Berg (Wozzeck), Bartok (Bluebeard’s Castle) and Britten (Billy Budd, although the ghost of Peter Grimes hides behind the entire enterprise) interspersed with odd but entirely logical melodicism and melancholy. Much of “The Point Of No Return,” which incorporates extracts from the Phantom’s own opera Don Juan Triumphant, teeters on a Bartokian whole tone/twelve-tone seesaw – and the implication that it’s the rest of the Paris Opera House that’s not keeping up – while the finale, in the Phantom’s lair/dungeon , consists of a distorted hall of mirrors of what has gone before, its troubled restlessness only relieved by Christine’s profound show of affection towards the Phantom; their embrace is far longer and much more intense than anything Christine does with Raoul. Shocked to the point of goodness by the first act of compassion and kindness that anybody has shown him in his life, the Phantom allows the two to leave, while he himself, having no further function (the last sung line of the show is “It’s over now, the music of the night”), disappears into himself. In other words, the Phantom cannot truly love another unless he can learn to love himself, or be shown how to do so. And the story may be a coded warning about the danger of letting music run your life so fully and intensely. Or it may be a larger parable about the choice one has to make between life and death. Christine goes off with Raoul essentially because he’s less hard work than the Phantom, easier to get on with…but I am not convinced that she ever really falls in love with him. In truth, Raoul is something of a pompous bore, and he may get the final comeuppance; the most important scene in the show is the first, set in the auction room thirty years later – in 1911, one year after Leroux’s novel was published, and three years before a war that would demolish a generation – where an aged and alone Raoul turns up to purchase the same monkey-shaped music box which we hear the Phantom playing at the show’s end (remember that, at the end of My Fair Lady, Higgins is left listening to a gramophone record of Eliza). He speaks of Christine in the past tense (“Every detail exactly as she said…she often spoke of you, my friend…/Will you still play when all the rest of us are dead?”). He has been left shattered by something – nothing to do with the patched-up chandelier which is “Lot 666” – while the Phantom is seemingly immortal. Did she go off with the Phantom in the end? In Leroux’s book they are mentioned only as travelling to “the northern railway station of the world” – possibly in Norway – where they “had withdrawn far from the world to enjoy a happiness which they would not have cared to make public.” The Phantom Of The Opera could teach you not to trust anything. Steve Barton does exactly the job needed for Raoul, even though I think Scott Walker could have brought the role a necessary darkness. Sarah Brightman, then still only twenty-six, is shrill and emotionally uncertain. Whereas Michael Crawford’s Phantom is about right; his is the voice of an actor who does not (or had not, at that stage) sing much, but with enough natural authority to overcome his occasional hesitancies (though, for British observers, perhaps not quite enough authority to overcome the collective memory – this is Frank Spencer singing, somebody who desperately wants to be ordinary but lacks some essential component enabling him to do so, and as such becomes somebody and something else entirely. Webber’s initial instinct was to cast Billy Mackenzie, but I do not think that would really have worked out, on the stage night after night, and besides the Phantom’s songs are not really Mackenzie material – the most Associates-like sequence is the one in the “Stranger Than You Dreamt It” segment beginning “Fear can turn to love...” (furthermore, the preview “Phantom Of The Opera” single was performed by Brightman with, of all dissatisfied mavericks, Steve Harley). Michael Reed conducts an orchestra full of seasoned luminaries; one of the keyboard players is Rod Argent. But listen to Raoul’s “Christine, I love you!” at the end of Act One, and the Phantom’s “Christine, I love you…” (the punctuation is important) at the close of Act Two, and consider which one meant it more, or which one finally meant more to Christine. Furthermore, consider the double meaning Webber has lent to the show’s name – here we are presented, or confronted with, the phantom of “The Opera,” and the question of how a work of art whose literal meaning involves the inclusion of everything, and it’s up to us to decide how far it can help us live, or survive.